It is this mom’s humble opinion that the nation’s most ubiquitous kids’ arcade and pizza venue grew to such heights of popularity in spite of its slightly disturbing six-foot rat. We parents have to admit that when it comes to party places and entertainment destinations for the kids, ease is paramount, value is critical and quality… well, quality seems to have become more of a wishful thought than a real expectation. (Six-foot rat case in point; I mean, how much cardboard-tasting pizza and mind-numbing animatronic songs can one parent take before she loses just a little bit of self respect?) So when a great venue enters the scene and it stands to offer all the convenience of the food-and-fun combination AND it offers a quality experience, it’s like discovering a gem; it’s like reclaiming a bit of dignity. Welcome to Fuzion – Meet. Eat. Play. of Huntington Beach. 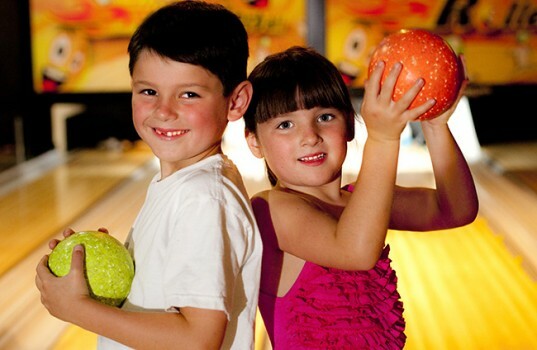 Fuzion is where every member of the family – from the squirmy 4-year-old to the even squirmier 14-year-old, to the arcade-jaded parents and all the family friends – can find something to love. It’s that whole-family experience that owner-operator Keeli Scott Lisack is going for, and she has come up with a winning formula. 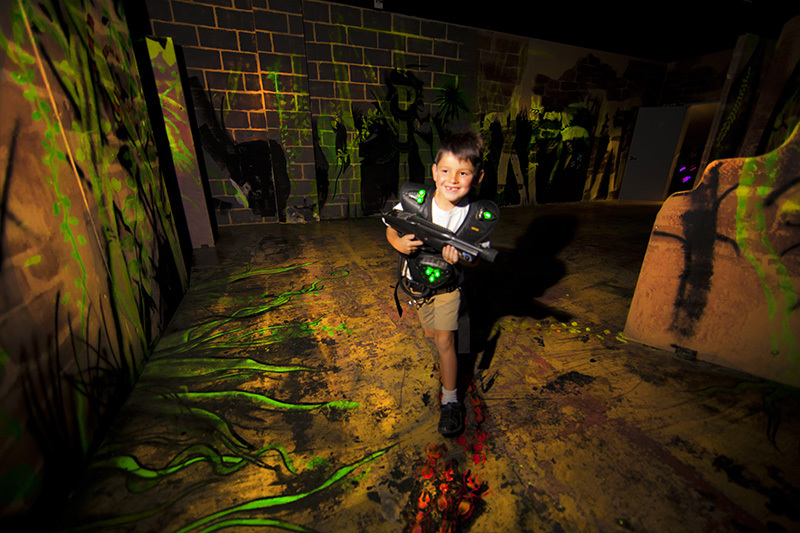 Fuzion is home to not one but two of the most advanced, state-of-the-art laser tag arenas in Southern California, complete with laser lights and glow in the dark themes split into two sections – neon jungle and neon graffiti. And at 7,000 square feet of playable space, it’s the biggest laser tag destination on the West Coast. 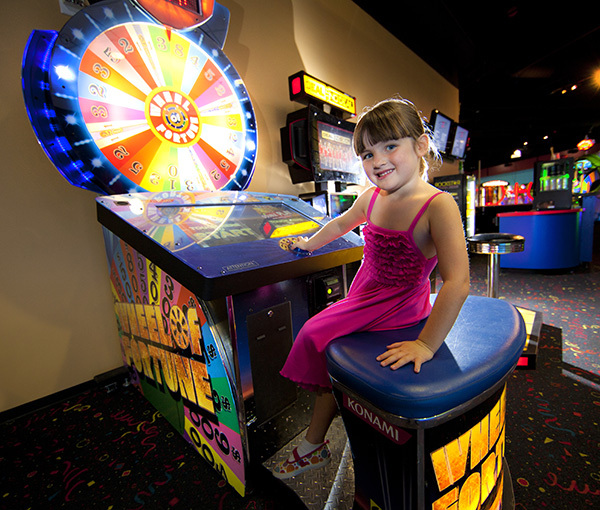 In addition to laser tag, Fuzion offers an amazing array of arcade, ticket and prize games, including the latest must-play titles like Space Ballz, Ball Spectacular, Triple Turn, Transformers and Ticket Mania, as well as classics that will even rope in the parents, like PacMan and Skee Ball. There’s even a four-lane mini bowling alley (which is exactly what it sounds like – a scaled down, super fun version of the regulation game). Into karaoke? Fuzion has that, too. One quality that sets Fuzion apart is its level of service. Management and staff clearly have an understanding of the principles of hospitality, a welcome departure from the churn-and-burn experience that the big-chain entertainment venues have to offer. When it comes to a night or weekend drop-in for fun and games, the highly professional and friendly attitudes displayed by team members make things pleasant; but when it comes to party-throwing that attitude makes things awesome. And with vast and functional meeting spaces, conference rooms and banquet halls, shindigging at Fuzion is easy. Whether you’re planning your 9-year-old’s birthday party, a summer family reunion, a school fundraiser, or a holiday hoorah, Fuzion can accommodate you. One of the secrets to Fuzion’s success is that Keeli hasn’t forgotten a couple of important things: M-o-m and D-a-d. For them, there’s “Z” by Fuzion, the signature restaurant that serves as the centerpiece of this entertainment Mecca – where guests routinely report being pleasantly surprised to find such exceptional fare in a type of venue not traditionally known for its culinary offerings. Familiar favorites like the East Coast Philly Sandwich, pulled pork sliders and half pound Premium Angus burgers reside alongside inventive gourmet dishes like Quinoa and Spinach Stuffed Peppers, Orange Chicken Mole, Spicy Thai Pasta and the Harvest Salad Pizza which arrives with artichoke hearts and caramelized onions baked into a hand-tossed pizza crust topped with arugula, apples, gorgonzola cheese and chopped pecans. These all served alongside craft beers, fine wines and specialty cocktails (for when we leave the kids with a sitter). If you’re a sports fan, Fuzion has the space – perfect for spectators who want to watch the game with a few family members or 100 of their closest friends. And then there’s the laughs. Fuzion is home to the Surf City Comedy Club. With shows Thursday through Saturday, Surf City Comedy Club features standup comedy from world-class funnymen and women hailing from across the county and across the country. To connect with Keeli at Fuzion – Meet. Eat. Play. at 7227 Edinger Avenue in Huntington Beach, call (714) 377-7671.